Australia, Bangladesh, Belgium, Bosnia and Herzegovina, Brazil, Bulgaria, Canada, Croatia, France, Germany, Ghana, India, Indonesia, Italy, Kenya, Lithuania, Macedonia, Malaysia, New Zealand, N. Ireland, Pakistan, Philippines, Poland, Romania, Russia, Serbia, South Africa, Sweden, Trinidad, Tunisia, UK, Ukraine, USA, and Zimbabwe. The Judge was Tomislav Maretić and Đ.V.Rožić. They decided on first prize, two second prizes, three third prizes and eighteen Honorable Mentions. The 12th Pumpkin Festival will be held on October 15-16, 2016 and after that we will send the diplomas and the joint collection to the authors. Many thanks to all poets who took part in the contest and congratulations to all poets with awarded poems. Please join us next year, the deadline moved to JUNE 30, 2017.
tropical rain . . . 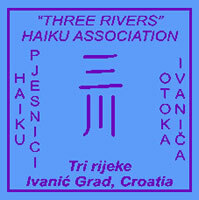 In Haiku/Senryu section the judges decided on first, second, three third prizes and eleven Honorable Mentions.